California is the prettiest state in the country. There, I said it. Allow me to explain my reasoning...If you had just one day to visit here, you could be in the mountains, the desert, the city, and the beach...all in one day. Forgive me but I don't know anywhere else in the country that you can do that within that kind of time frame. They don't call it "The Golden State" for nothing. With that being said, I took this past weekend and drove up the coast to an area known as Big Sur. One of the prettiest places on the planet, in my opinion, and it's world famous for the drive up Route 1 (which is supposed to be one of the prettiest scenic routes in the world). Big Sur is a place where the mountains converge with the ocean and it houses some of the biggest Redwood Trees in the state. The drive took us about 7 hours total, with a few stops along the way. 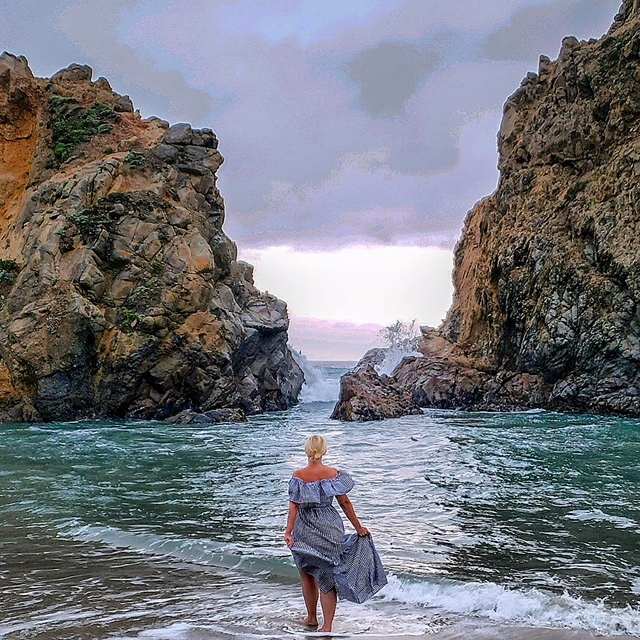 If you're going to visit Big Sur sometime soon, you should check these places out below. Overlooking the famous Bixby Creek Bridge! The Bixby Creek Bridge- located along the coast of Big Sur, one of the most famous lookouts in the world. If you go now through summer, the sun sets later around 8pm so to get those golden hour photos, it is best to go around 6:30-7pm. *Wondertip: You can only access Big Sur and Bixby Bridge through the north as Route 1 Southbound is still closed at Hearst Castle and up through Gorda. The only way to get to there is to drive through Carmel and the Carmel Highlands. 2. Pfeiffer Big Sur State Park- located in the heart of Big Sur, this state park is great for hikes, picnics, swimming in the river (the water is freezing), and wandering around checking out the large Redwood Trees. *Wondertip: If you want to cool off, bring your bathing suit. You can jump off some of the rocks into the cold river. Beware the chilly temps as it's freezing water! 3.Julia Pfeiffer Burns State Park- not to be confused with Pfeiffer Big Sur State Park- both are completely different! This spot is one of the most famous Instagrammed photos in the world. You can take the trail down to the waterfall that goes into the ocean and the water is emerald blue! Gorgeous! *Wondertip: The best place to park (if you don't want to pay) is right after you cross the bridge (if you are heading south on Route 1). You can park on either side of the road and you will see steps that will lead you down to the trail. Look for the Eucalyptus trees. 4. The Big Sur River- a natural hot spring that flows annually providing opportunity for swimming, camping, fishing and picnicking. Fun to play in! 5. Pfeiffer Beach- the prettiest of the very few public beaches in Big Sur, it has the rising rocks right out of the ocean! Perfect for photo opportunities, especially at sunset! *Wondertip: This is a hard beach to find. The street you turn off to get to it is located between Big Sur Bakery and Rancho Rico. If you're heading south on Route 1, it will be on your right hand side, the first right after Rancho Rico. If you're heading north, it's on the left hand side, about 1/2 mile north of the Big Sur Bakery. If you've gone more than a mile, you missed the turnoff. It's an almost secret road (look for the yellow sign that says "No oversized vehicles". You will come up on a sign after turning in that says "Pfeiffer Beach - 2 miles"). There is very limited parking so I recommend getting there as early as possible. The beach is open from 6am to sunset. 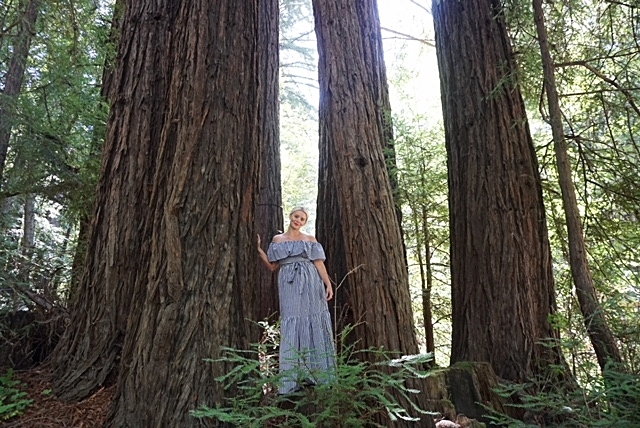 Look at how tall the Redwoods are in Pfeiffer Big Sur State Park! The welcome sign to the park! Overlook at Julia Pfeiffer Burns State Park! Playing in the Big Sur River! Riverside Campgrounds and Cabins- this is where I stayed and it was awesome. You drive over the Big Sur river when you enter to get to the front office. We stayed in a cabin and it was just perfect! Glen Oaks Big Sur- a great place to stay that's right in the heart of Big Sur. Close to the Riverside Cabins and has a great cafe close by called The Big Sur Roadhouse. The Post Ranch Inn- one of the prettiest and also most expensive hotels in Big Sur, these rooms offer spectacular ocean views perched from the top of a cliff. It has the best restaurant in Big Sur called Sierra Mar. Even if you can't afford to stay here, you should grab dinner or a drink because the views are exquisite. My husband took me here for dinner and the dishes were out of this world! The Camp Store at The Riverside Cabins! How cute is this place!? WonderFact: These beautiful flowers are called Purple Echium Flowers. They bloom all over Big Sur! Overlooking the Pacific Ocean and you can see Route 1 in the background! Beautiful! Our view from Siena Mar, the restaurant at the Post Ranch Inn!